The AX Lightness sprint saddle was the lightest saddle I could find. It also looks great. I’ve been riding the sprint version for the past couple of weeks. Mostly hill climb training, but also some longer endurance riding (3 hours plus). another view of the AX lightness. I know you don’t buy a saddle for aesthetics, but it does look good. If you want a bit of bling – this is as good as it gets in the saddle department. 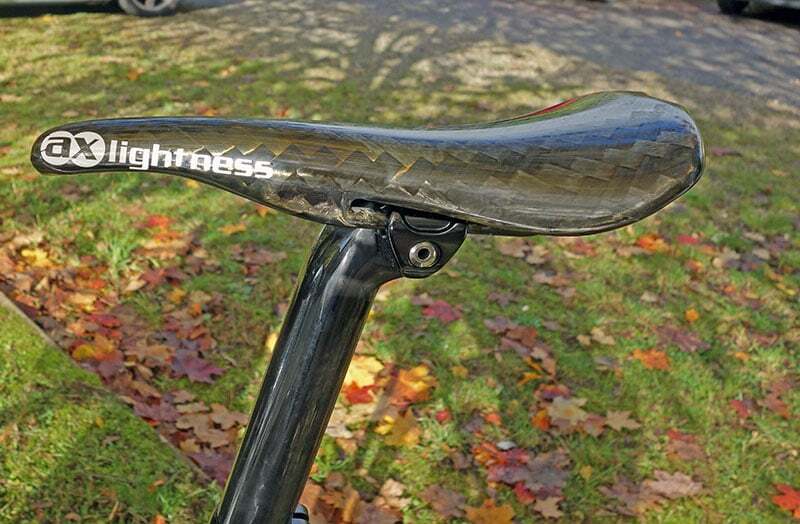 The Sprint Saddle has a very low weight at 69 grams. I haven’t seen a lighter saddle. The Tune Concorde comes close at 73 grams, but it is more awkward to fit. A few years ago, I had to send mine back because I couldn’t attach it to my bike. The sprint saddle is a narrow fit, making it aerodynamic especially in the race prone position. There is no padding at all, you are sitting on sheet carbon fibre. It is more comfortable than it looks – as long as you have good padded cycling shorts. I’m kind of used to sitting on these kind of saddles. In a strange way they can be more comfortable than you expect. I’ve done long rides on these saddles without getting saddle sores. I wouldn’t want to do a 12 hour ride on one, but I can quite get used to the saddle. One draw back with these carbon fibre saddles is that they are very smooth, and if you’re not careful, you can slip around. Some people might find this a little disconcerting. AX lightness do some models with leather padding or other coverings, should you want to get more grip. Personally, I don’t mind and haven’t ever felt compromised by slipping around on the saddle. It is a beautiful piece of engineering, they have done a really good job in making the rails seamlessly mould into the saddle shape. 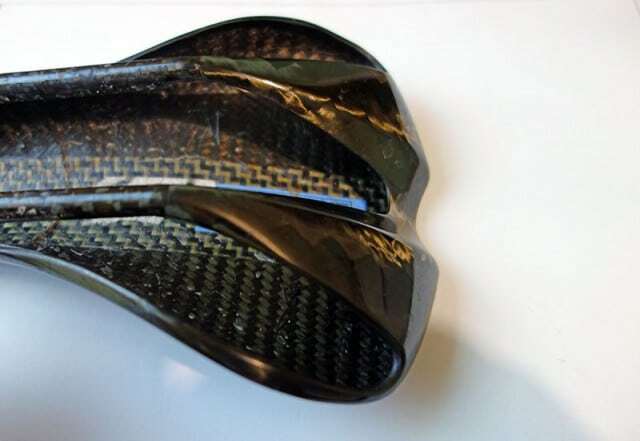 It’s a one piece carbon fibre construction. Who would have thought a saddle could be a thing of beauty? 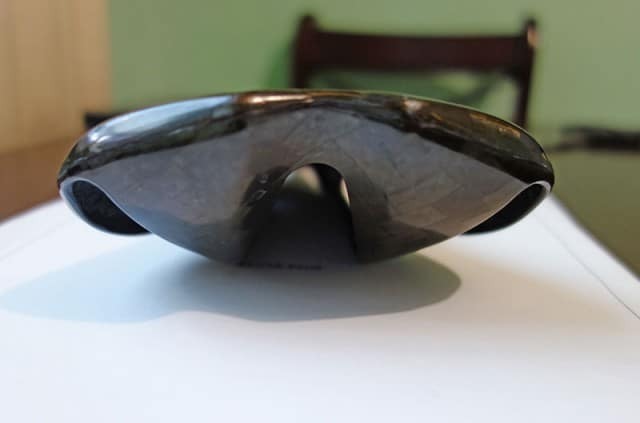 One motivation for buying the AX lightness saddle was that my old Tune Kor Vum, seemed to have a lot of flexibility – I was worried about losing power from the flexibility of the saddle. 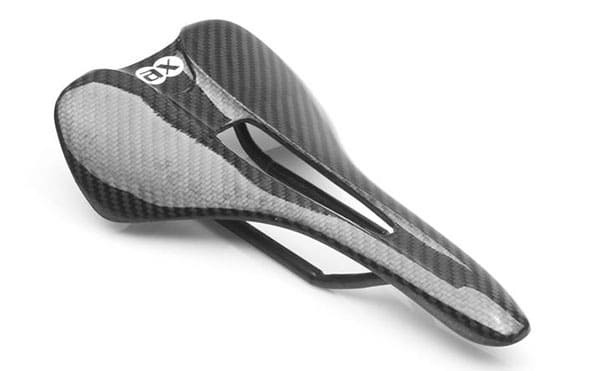 The AX lightness saddle is possibly stiffer, but not much – you still get a bit of ‘give’. I don’t think it compromises ride, but I am a very light rider (61kg). Also this little ‘give’ makes the saddle more comfortable than you might expect. Can a €269 saddle weighing 69 grams ever be good value for money? If you’re missing out on national hill climb podiums by the odd second, you can perhaps just about justify it the cost/per kg saved. I bought mine second hand on ebay – partly because it was difficult to find a seller in the UK. 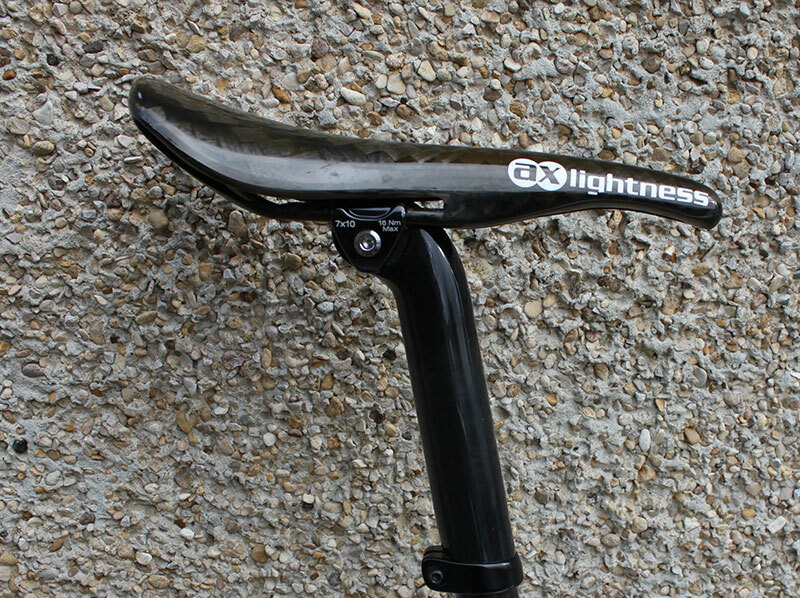 But, compared with other saddles, the AX lightness is not as expensive as you might expect. 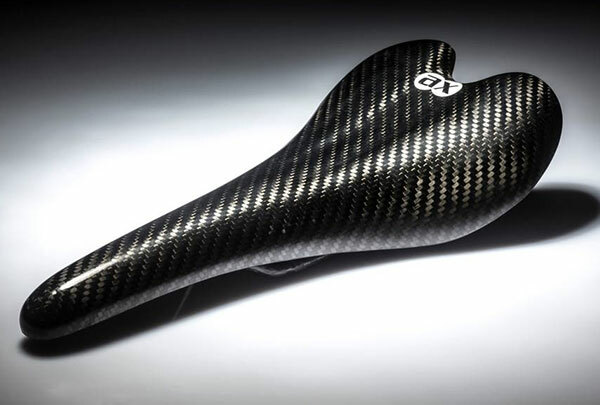 For example, the Selle Italia SLR Carbon saddle has a RRP of over £300, and weighs 95g. Given the build quality and impressive look, I think this is one AX lightness product which isn’t absurdly expensive. No, I’m quite glad to have this saddle. I can see myself using it for many years. For very long, endurance rides, I might swap for something more comfortable. But, for anything upto 4-5 hours, I’d be happy to use, so long as I had good padded shorts. Which is best model to buy? To make life complicated, there are quite a few different options. The endurance and leaf – featured below may be better suited to a rider more concerned about comfort and all round riding, than the odd 10-20grams (which you don’t really notice anyway). Unless you’re confident of getting on with minimalist saddle, you may be better off with padded versions. Also comes in Leaf Plus – with coloured comfort padding at the back of the saddle or AX Lightness Leather – an extra layer of comfort and a non-slip surface. 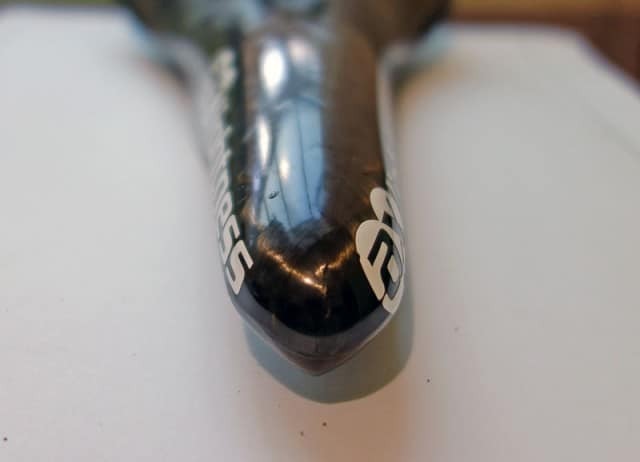 Becker carbon do a 48g carbon saddle-a bargain at €400 rrp.